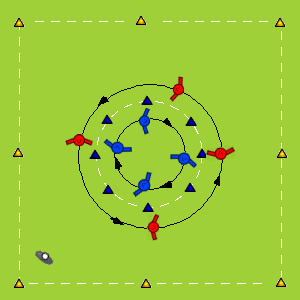 One team runs clockwise round the inside of the circle with the other team running anti-clockwise around the outside of the circle (blue cones). When the coach shouts 'Jailbreak' the players inside the inner circle try to 'escape' to outside the 10m x 10m square (yellow cones). The inside team scores a point for each 'jailbreaker' - swap over. If you have an odd number of players give the defenders the extra man. This is a good practice for both tackling and dribbling (when playing without balls defenders can tag players to 'catch them'). 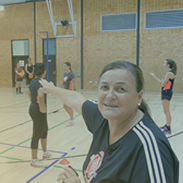 You can start this drill at walking speed to get your players going. Add balls to jailbreakers to dribble with if this is too easy and too many players get away. Hit, Miss, Run and Recover!